One of our Leaders tells us of her visit to Buckingham Palace for a special D of E Diamond event. 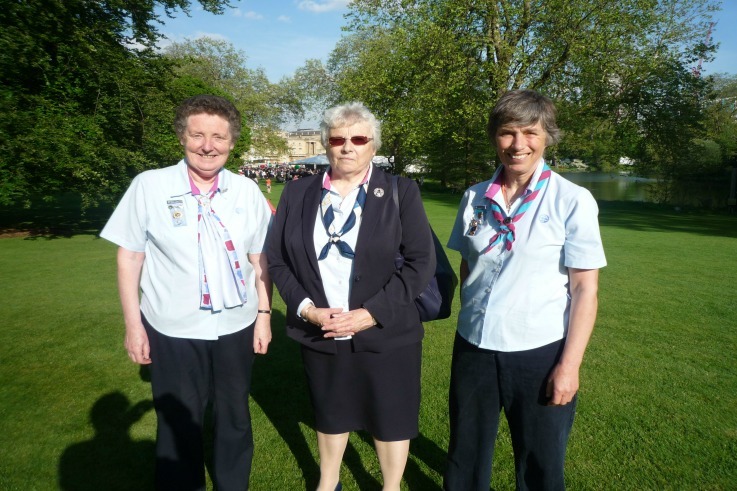 Fran Butler (pictured right), was lucky enough to be invited to the D of E Diamond Anniversary Celebration in the Buckingham Palace garden on Monday 16 May. “On a beautiful sunny day, in the delightful and tranquil setting of the Buckingham Palace Gardens, over 1000 Gold Award holders received their certificates and 1500 other guests represented Licensed Organisations. We gathered in smaller groups of around 100 people, each with a celebrity to make the presentations and inspire us with their life stories. Ours was Chris Hadfield, a Canadian Astronaut who undertook three missions into space, has done a space walk, and was, one one mission, in charge of the International Space Station. The Girlguiding group included four Gold Award young women plus their guests, our Chief Guide Gill Slocombe, together with the Chief Commissioners for Scotland and Wales, and the three D of E leads for those countries, as well as Girlguiding’s CEO and four leaders from different regions. Each Licenced Organisation received a D of E plaque to mark their membership and the event. The Duke of Edinburgh visited our group and talked to all of the young people receiving their Gold Awards. He was helped in the task of congratulating all award holders by The Earl & Countess of Wessex. In addition to the presentations and socialising, we all had time to explore the gardens, listen to two contrasting bands and enjoy some welcome refreshments. It was a wonderful day out, meeting inspirational people and blessed by the sunshine and the crowds. For more information on the D of E Diamond Challenge, see this link. To find out about participating in Duke of Edinburgh awards through Guiding, see this link.